1. Shop safety. 2. Introduction to diesel engines. 3. Diesel engine cylinder blocks 4. Cylinder head assemblies. 5. Intake and exhaust systems. 6. Cooling and lubricating circuits. 7. Fuel subsystems. 8. Injectors. 9. Pump line nozzle (PLN) fuel injection systems. 10. Electronically controlled injection systems. 11. Engine electrical (cranking and charging). 12. Engine electronics. 13. Emissions controls. 14. Servicing and maintenance. 15. Diagnostics and testing. 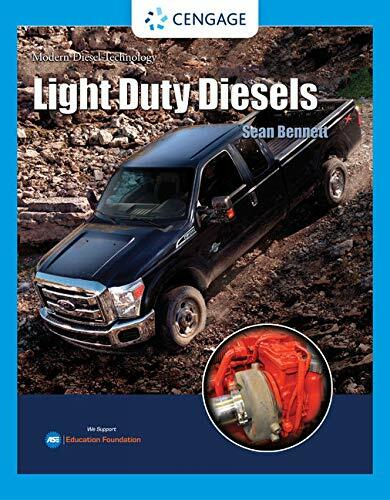 MODERN DIESEL TECHNOLOGY: LIGHT DUTY DIESELS provides a thorough introduction to the light-duty diesel engine, now the power plant of choice in pickup trucks and automobiles to optimize fuel efficiency and longevity. While the major emphasis is on highway usage, best-selling author Sean Bennett also covers small stationary and mobile off-highway diesels. Using a modularized structure, Bennett helps the reader achieve a conceptual grounding in diesel engine technology. After exploring the tools required to achieve hands-on technical competency, the text explores major engine subsystems and fuel management systems used over the past decade, including the common rail fuel systems that manage almost all current light duty diesel engines. In addition, this text covers engine management systems, computer controls, multiplexing electronics, diesel emissions and the means used to control them. All generations of CAN-bus technology are examined, including the latest automotive CAN-C multiplexing and the basics of network bus troubleshooting. ASE A-9 certification learning objectives are addressed in detail.